Acute kidney injury (AKI) is common after cardiac surgery, and no therapies have proved effective. Ma et al. 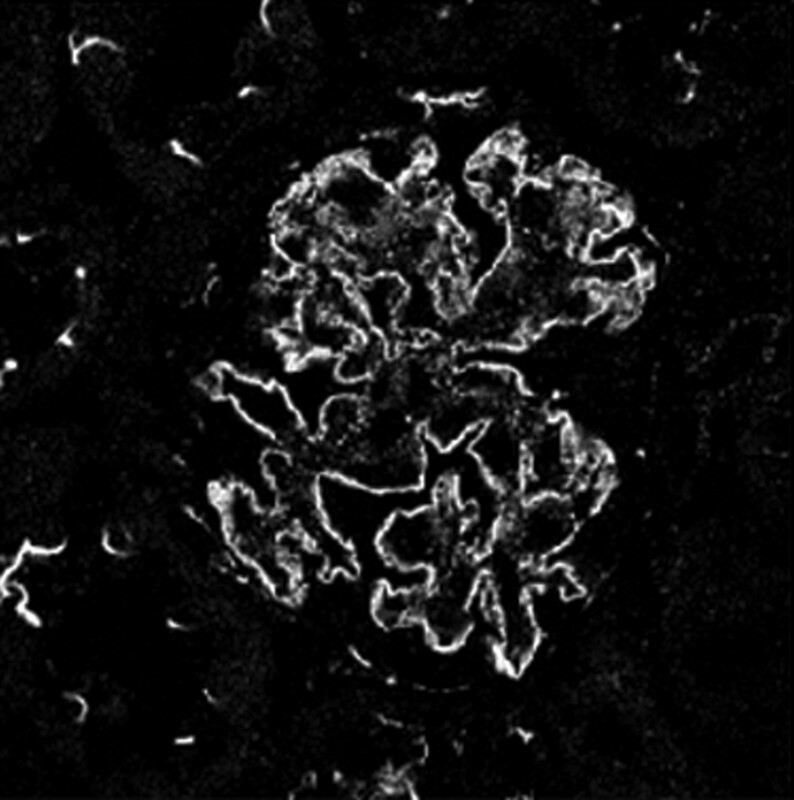 report that administering the anesthetic gas xenon protects the kidneys of mice in a model of renal ischemia-reperfusion. They demonstrate that xenon, under normoxic conditions, modulates the mammalian target of rapamycin pathway to increase the translational efficiency of hypoxia-inducible factor 1α (HIF-1α). 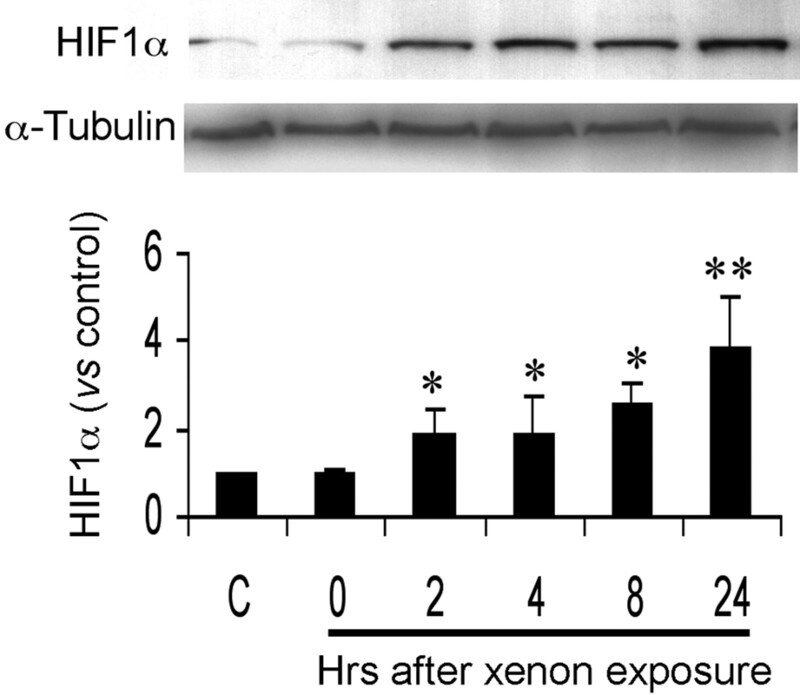 The xenon-induced HIF-1α prevents apoptosis, renal tubular damage, and renal dysfunction after ischemia-reperfusion. Because xenon is a remarkably safe anesthetic with favorable clinical properties, these data suggest that it may be a feasible agent for the prevention of AKI in appropriate human settings. See Ma et al., pages 713–720. Apoptosis of tubular epithelial cells marks acute kidney injury (AKI), but the signals involved in mediating apoptosis in AKI are incompletely understood. Bengatta et al. found that although matrix metalloproteinase 9 (MMP9) deficiency degrades matrix proteins that promote cell survival in some contexts, MMP9 deficiency in mouse models of AKI enhances apoptosis and worsens renal injury. MMP9 seems to release soluble stem cell factor from kidney tissue, which inhibits apoptosis and attenuates renal injury when administered to MMP9-deficient mice subjected to AKI. These data suggest an important role for MMP9 and stem cell factor in the control of apoptosis during AKI. See Bengatta et al., pages 787–797. Atypical protein kinase C (aPKC) is a component of a complex that regulates cell polarity. In this issue, Huber et al. demonstrate that one type of aPKC, aPKCλ/ι, is critical for the development and maintenance of podocyte foot processes. In mice, podocyte-specific deletion of this protein leads to abnormal slit diaphragms, foot process effacement, proteinuria, and renal failure. Moreover, they observed an apical-to-basal translocation of the aPKC-containing complex in podocytes during development, which preceded the formation of foot processes. The coordinated translocation of this complex may also target molecules to the slit diaphragm. These observations significantly contribute to our understanding of glomerular development. See Huber et al., pages 798–806. Modern immunosuppression has reduced the incidence of graft loss resulting from rejection. Because glomerulonephritis (GN) is the cause of kidney disease in up to half of patients who undergo transplantation, Chailimpamontree et al. reassessed posttransplantation GN in the current era. 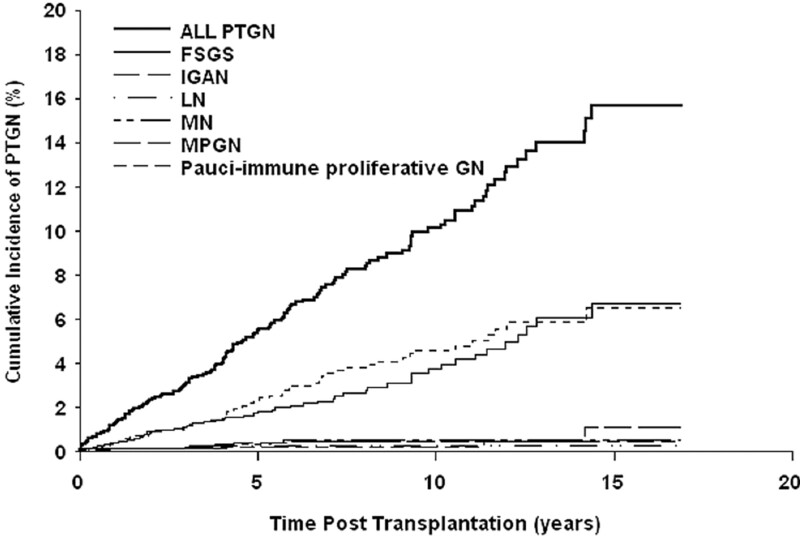 By following >2000 transplant recipients for 15 yr, they found that the cumulative probability of posttransplantation GN is approximately 5% at 5 yr and 15% at 15 yr. Biopsy-proven GN in the native kidney, male gender, younger age, and race other than white predict posttransplantation GN, which often leads to accelerated graft failure despite the use of modern immunosuppression. See Chailimpamontree et al., pages 843–851. Does screening the general population for albuminuria identify individuals who are at risk for ESRD? In this issue, van der Velde et al. report that among >40,000 participants from the general population screened for albuminuria, 45 initiated renal replacement therapy during 9 yr of follow-up. 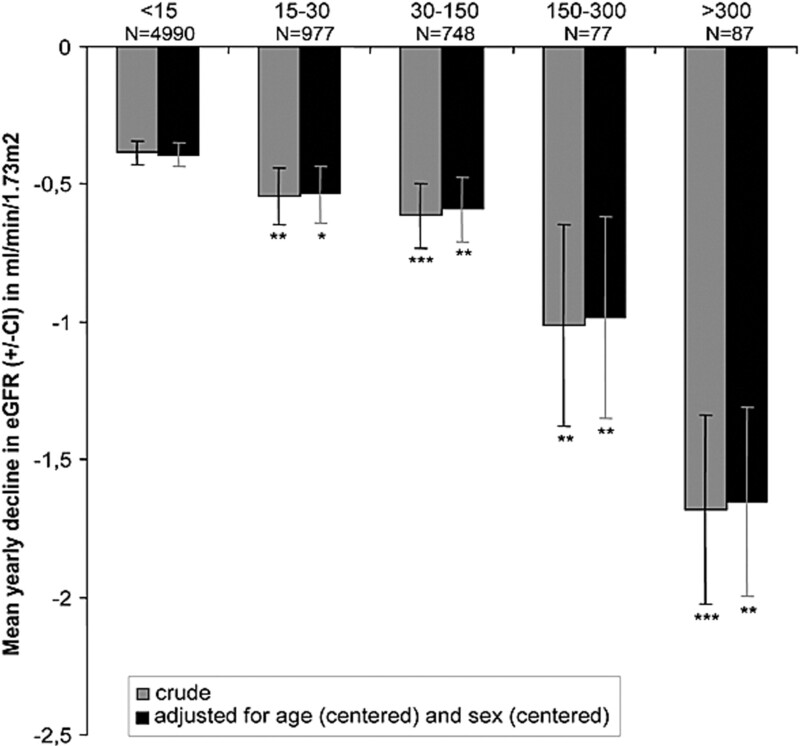 Urinary albumin ≥20 mg/L identified these individuals with 58% sensitivity and 92% specificity, and increasing amounts of albuminuria correlated with an increased rate of renal function decline. Nearly half of the individuals who developed ESRD were not being treated at the time of screening. These data call for additional studies to determine whether early identification affects the rate of disease progression and whether it is cost-effective. See van der Velde et al., pages 852–862. Whether individuals with diabetes who already have BP levels below recommended targets would benefit from further BP lowering is unknown. Here, de Galan et al. report the renal outcomes from the ADVANCE trial in which >11,000 patients with type 2 diabetes were randomly assigned to perindopril-indapamide or placebo regardless of BP at baseline. 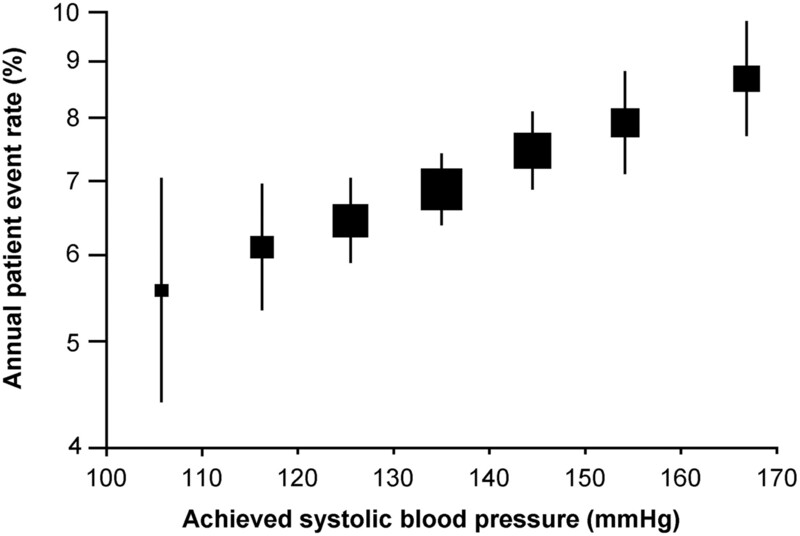 During a mean follow-up of 4.3 yr, they found that active treatment is renoprotective, even among patients with an initial BP <120/70 mmHg. These results suggest that BP lowering should be considered for all individuals with diabetes, even when their BP is already lower than current targets. See da Galan et al., pages 883–892.